Teenage entrepreneurs aren’t a new phenomenon in the valley – 17 year old Kristopher Tate founded Zooomr back in 2006, and Jessica Mah could call herself a serial entrepreneur by age 17. But it’s still pretty rare to see a startup founder get dropped off for work by his mother. At our August Capital event last week, I met 15 year old Daniel Brusilovsky for the first time. While I had come across a few videos on the web detailing this young man’s enthusiasm and eagerness to succeed in the tech space, I was still taken aback by just how bright the kid is. He seems to know everyone, and a quick glance at his Twitter account shows he gets around too, with recent visits to Twitter, Apple, and the TechCrunch ranch – all without a drivers’ license. Today Daniel is launching his first startup. 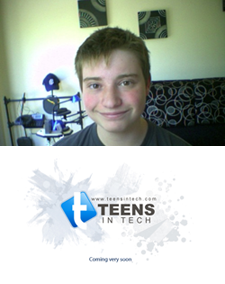 The site is Teens In Tech, a community for teenagers interested in producing and sharing new media content in a safe environment. The site launches today in a very limited private alpha, with plans to expand to a public beta by the end of the year. Brusilovsky says that while there are a number of sites that allow teens to post their content, they don’t make it easy for users to get started. To try to remedy this, Teens In Tech has a simple 3-step signup process, after which users will be given their own subdomain, WordPress blog, and 100MB of storage (the last figure can be easily changed depending on user needs). Users are also given access to a Teens in Tech forum, where they can go to ask questions about new media, or anything else they may have on their mind. From a technical standpoint Teens In Tech will be fighting an uphill battle. The site is using Dreamhost, a cheap service that most companies wouldn’t go near with a ten foot stick, as its storage provider. And to be perfectly honest, it doesn’t seem like there’s much new code behind Teens in Tech – the backend is a mostly standard WordPress multi-user install, similar to what runs on the commercial WordPress.com site. Brusilovsky says that his team has made some adjustments and that the front page will display dynamic member updates, but for the most part, it seems like a few experienced developers could replicate the site in a week or less. That said, Teens In Tech may appeal to a niche community of tweens and teens who aren’t satisfied by the plethora of other blogging services already available. Brusilovsky has amassed an impressive list of supporters, with a board of advisers that includes Robert Scoble and Loic Le Meur. And the site is still relatively early in development – given enough resources, I wouldn’t be surprised if Daniel manages to pull this thing off.